April 23, 2016, marks the 400th anniversary of the death of William Shakespeare, the most famous writer in the history of the English language. To commemorate this event, the Folger Shakespeare Library in Washington, DC, has assembled a traveling exhibition of the Bard’s first printed collection of works, known as the First Folio and considered one of the most valuable books in the world. The exhibition is visiting all fifty states, and the Newcomb Gallery at Tulane University represented Louisiana, hosting the First Folio May 9–31, 2016. To show support for this wonderful cultural opportunity, THNOC presents “Merry as the Day Is Long”: Shakespeare’s Hand in New Orleans, a small-scale exhibition at the Williams Research Center examining the lasting influence of Shakespeare’s life and work in New Orleans. In the 19th century, the growing English-speaking population of New Orleans was establishing itself alongside the deeply entrenched French and Creole communities. One way of championing Anglo identity was through the performing arts, specifically by showcasing the work of the greatest known practitioner of the English language. Two different theaters were built in the Central Business District catering specifically to the Anglo population. Included in “Merry as the Day Is Long” are playbills for Shakespeare productions from both the St. Charles Theatre, located on the 400 block of St. Charles Street, and the American Theatre, on Camp Street near Poydras. Shakespeare also lives on in New Orleans’s street theater of Mardi Gras. To this day, parading krewes make great use of literary and mythological sources in planning the themes of their parades and in designing their floats. 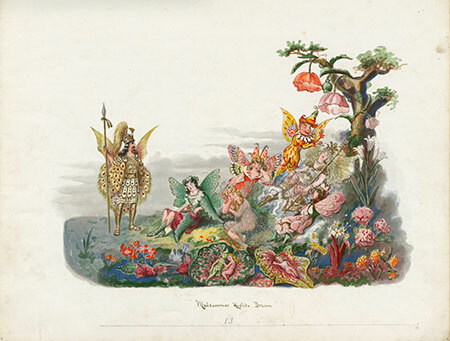 The exhibition features original designs, such as Momus’s 1878 float inspired by A Midsummer Night’s Dream and Hermes’s Lady Macbeth tribute from its 1949 parade. Other items on display will include materials relating to the Shakespeare Club in New Orleans, which had a building at the corner of Canal and Dryades.